An essential part of studying to become a physical scientist or engineer is learning how to solve problems. This book contains over 200 appropriate physics problems with hints and full solutions. The author demonstrates how to break down a problem into its essential components, and how to chart a course through them to a solution. 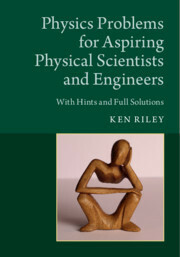 With problem-solving skills being essential for any physical scientist or engineer, this book will be invaluable to potential and current undergraduates seeking a career in these fields. The book is divided into three parts: questions, hints and solutions. The questions section is subdivided into 15 chapters, each centred on a different area of physics, from elementary particles, through classical physics, to cosmology. The second section provides brief hints, whilst the third sets out full and explicit solutions to each problem. Most begin with thoughts that students might have after reading a problem, allowing the reader to understand which questions they should be asking themselves when faced with unfamiliar situations. Preface; How to use this book; 1. Dimensions; 2. Statics; 3. Dynamics; 4. Rotation; 5. Gravity; 6. SHM; 7. Waves; 8. Solids and liquids; 9. Electrical circuits; 10. Electrostatics; 11. Magnetic fields; 12. Electromagnetism; 13. Heat transfer; 14. Gases; 15. Particles and atoms; Hints; Solutions; Physical constants. Ken Riley is a retired Lecturer in Physics at the University of Cambridge Cavendish Laboratory. He is also a Fellow of Clare College, Cambridge, where he was both the Senior Tutor and Admissions Tutor, and taught physics and mathematics for over forty-five years. He has served on many committees and panels concerned with the teaching and examining of these subjects at all levels of tertiary and university education. His research was centred on nuclear physics at Harwell and then elementary particle physics at Brookhaven, New York, the Rutherford Laboratory and Stanford. He is the lead author of Mathematical Methods for Physics and Engineering (Cambridge, 3rd edition, 2006), and a joint author of both Foundation Mathematics for the Physical Sciences (Cambridge, 2011) and Essential Mathematical Methods for the Physical Sciences (Cambridge, 2011). He is a co-author of 200 Puzzling Physics Problems (Cambridge, 2001) and the consultant editor for 200 More Puzzling Physics Problems (Cambridge, 2016).